Dan Gilroy is trending in the wrong direction after the third film of his directorial career. Nightcrawler was dark and and strange and interesting, Roman J. Israel was unfocused other than its lead performance, Velvet Buzzsaw is all of those things but also miscast, misled, and mismanaged to the point of ridicule. Gilroy has been blessed with some real talent in his films, enough to cover his lack thereof, but the paint is starting to rub off and we can see the rust underneath. He’s also a writer, but not a very good one, except for The Fall, which I thought was excellent; the rest of his scripts are amateur at best. I don’t mean to pick on someone I’ve never met and who can’t defend themselves because why would they ever read this, I simply can’t lay the majority of the blame anywhere else than at the director’s feet, and I can’t recommend watching any more of his movies. In the vibrant art scene of L.A., careers are created and destroyed at the hand of Morf Vandewait, the city’s premier critic and harshest judge. He says what’s good, collectors hang on his every word, and if he doesn’t like you you’re toast, don’t let the gallery door hit your installation on the way out. Morf has plenty of enemies who wish he’d vanish and friends who know which side to be on, so he’s never without an angry artist, a lover, or a party invitation; such is the life. But his real breakthrough, the art that will make his career and his book deals and his legacy come to life, comes when he least expects it. A friend named Josephina stumbles upon the body of a dead man, who apparently was quite the artist, and she saves his work, which was destined for a trash bin. And his work just happens to be amazing, sets the entire community ablaze, with Morf and his colleagues at the center of a bidding war for the pieces. The catch is that anyone who gets too greedy for their favorite painting ends up dead at the hands of the oil and canvas they can’t stop staring at, this spirit of evil stalking the L.A. art world catching whatever prey falls into its net. 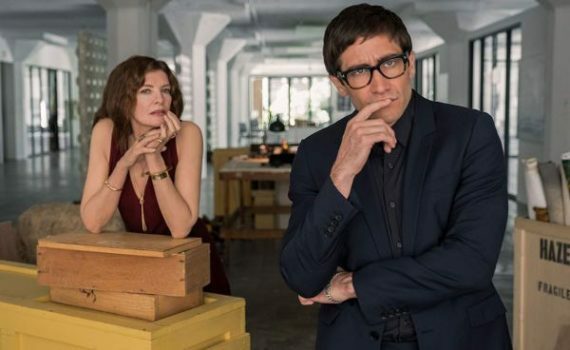 Straight to Netflix and billed as a unique take on the horror genre, Velvet Buzzsaw turns out to be anything but. What at first seems like ingenuity quickly turns into recycling, as every movie you’ve ever even thought of seeing takes the stage under the guise of new wave frights. It’s like Stephen King wrote a good short story 30 years ago, threw it out, Dan Gilroy found it, and somehow convinced Jake Gyllenhaal to star in its adaptation. There’s no originality here, not from a movie about paintings that kill people one by one; to whom, exactly, did that sound like a good idea? And then there’s the cast, which would take me hours to pick through and to describe to you everything that’s wrong with each of them and why they were all the exact wrong choice. Gyllenhaal was fine; that seems to be Golroy’s saving grace, that he always has a stellar lead actor to lean on. But everyone else; god. Ashton was laughably bad, Russo was simply as bad as she’s always been in every film she’s ever been in, Toni Collette was silly, John Malkovich was unnecessary, Billy Magnussen was throwaway, and all Natalie Dyer did was look scared and scream. A mix of pretentious ideas and obvious morals that mixed together to create something that no one should want to see, Velvet Buzzsaw is both a disappointment and a last nail in the coffin.